Pretty, looks nice, fits well. 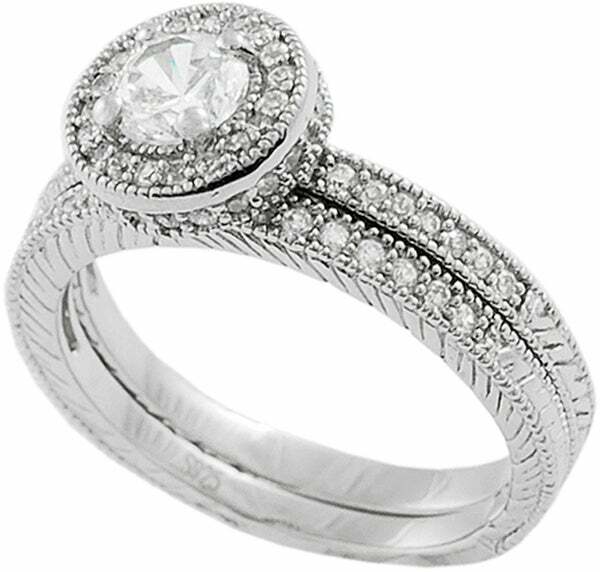 This dazzling wedding ring set features a 5.3-mm cubiczirconia center stone encircled more sparkling CZs. Multiple cubiczirconias and decorative beadwork adorn the wedding band. I previously bought the other bridal ring set that looked very similar to this one but the center stone was alot bigger, it looked fake, and it was about $10 dollars more. So I sent it back and decided to try this one. I was kind of worried about buying this ring because some of the reviews said it looked faked and the center dimond was cloudy. Plus I like to see in person what I'm getting. OMG I'm so glad I ordered this. First I have no idea what people are talking about when they say the diamonds are cloudy looking. They give off just the right amount of shine. It is really breath taking ring. Second, some reviews mentioned about the ring itself feeling cheap. It does not feel cheap. It is sterling silver so its weight isn't going to be as heavy as white or yellow gold. Third, I just absolutely love this ring and so glad I purchased this. I will not be returning this one. Its a keeper. I purchased this ring to wear in place of my wedding set that is too sharp to wear around my baby. This ring is fairly smooth and hasn't snagged anything - it is a great stand-in for now. It has a lot of sparkle, but lacks the depth of a real diamond. Nevertheless, people tend to think it is real and are surprised when I tell them it isn't. It is very light-weight, and the silver is a brighter metal than white gold, so I might let it tarnish a bit to better approximate the real thing. The only problem I've noticed is that there are some minor flaws in the detail work along the bands, but it's only apparent if you are looking very closely. It's a pretty little ring. I JUST received this ring, so I'm not sure I'm totally qualified to comment on its durability quite yet, but WOW, this ring is beautiful! It has a very vintage feel to it. Everybody I've showed it to so far cannot believe it's not "real." It's has a beautiful sparkle to it without it going over-the-top. I will say that the etched design in the band does "give it away" and cheapen it at little bit (because the stone itself doesn't have that rainbow-y look to it that CZ's usually do), but you hardly notice the band with all sparkle, haha. Also, I am in between sizes (7-8) and I was afraid the 7 would fit too snug, so I ordered an 8. It fits a little loose, so I imagine they are very true to size. All in all, I am incredibly satisfied with this ring. It's my first purchase from Overstock, and I will definitely recommend! This ring is amazing! SO beautiful and antique looking. Definetly what I was looking for. Has a lot of sparkle and doesn't look over the top fake. I ordered it too small but I loved it so much that I quickly ordered the correct size. I didn't want to wait! I totally recommend this ring! This ring is a classic beauty. It has a vintage look with an updated Halo style for a perfect combination! The sparkle and 1/2 carat (great casual size) CZ truly looks authentic and the stone sits low enough that it does not snag on things. It's a great set if you just want to change up your look or for couples getting married who would rather save $$ for other things but still have a beautiful engagement ring & wedding band too. You got your great man and now you have a great ring too. I'll be wearing my new bridal set a lot and it won't get in the way while sailing on my familys boat this upcoming season. I love the winter snow as it sparkles like this ring but it's time for spring. Life is beautiful so have a wonderful journey!! I've received more compliments on this ring than I ever got on my real diamond engagement ring and band 10 kt white gold. After 2 years the bands have darkened a little, but I have been rough on these rings. I wear them in the pool, when I clean, etc. I guess I am the only one who notices though because I still get so many compliments on its beauty. The center stone is still as shiny as day 1. I accidentally threw away my engagement and wedding rings, and wanted something inexpensive to wear until we can afford to replace them. These rings have been all I could have asked for and then some. For what I paid for them, I'd say they have been an unbeatable deal! After heart surgery, my husband decided to gift me with a new wedding set. After looking at many rings, we chose this one. It was close to my original set, which were lost during a move. The ring is very comfortable to wear and because it is low profile, I don't snag it. It looks nice on the hand and i find that I can wear the wedding band alone. I recommend this ring to everyone! This ring looks so much better in person. Don't hestate to purchase. The stone sparkles and the size stone is just right. I live in Boston and we know our jewerly. When taking the commuter rail to work besides looking at your I-phone we check out each others hardware. You can spot a fake ring or a lowgrade diamond very easily. Boston has class and style and this ring has both. Even my diamond snob friends loved this ring set and thought it a real. LOL. I love that this awesome ring set is a CZ because it keeps the cost low and if you loose it just buy another one. Enjoy. I bought this set as my wedding set since I don't agree with the diamond trade, but I still wanted something pretty to wear. You can definitely tell it's not "real" when you feel its weight (it's very light) but it looks great on my finger. I've never owned a real diamond so I can't say if the stones in this set look genuine or not. I also can't speak to the durability since I haven't gotten married yet so I'm not wearing it every day. But I did put it on one day for a couple of hours to see if I could deal with the weight and the rise of the central stone, and it felt great on. I can't wait to start wearing it permanently! I was a little disappointed when this ring first arrived. I thought the metal looked a little fake. Almost sent it back, but then decided it was worth the money, even if it did look fake. Was really surprised to find that I received more compliments on this ring than any other I have worn. Everyone, and I mean everyone, seemed to think it was an heirloom diamond ring. Who am I to argue with all those compliments? Still not my favorite, personally, but it's truly amazing how many people fell in love with this. When I got married, I decided that the money spent on rings would be better served elsewhere, like travel. Nevertheless, I wanted something on my finger. If you keep this clean it looks real and has the right amount of sparkle without screaming fake. I'm not a fan that the center is welded on to the ring which doesn't go all the way around, then again, I am the only who knows. I have received plenty of compliments on this and to my knowledge, no one has said it looks fake. In fact, a friend of mine liked the style so much that she chose a very similar set, however, hers cost $XXXX. I ordered this ring because I wanted something that kinda looked vintage but not. When I received it I was impressed. I have small hands and it looks really nice on my finger. I will be making more purchases from Overstock in the future. Most of the time you cannot beat the prices for what you get! have gotten several compliments on this ring...no one seems to know it is not real! The ring looks just like it does in the picture. I bought this to wear while traveling so I didn't have to risk my real set being stolen or lost. I was really excited when I opened it, but as I have worn it for the last 2 weeks (on a vacation) it has lost some of its sparkle. The first day someone actually asked me if I was worried about "having that" (pointing to my rings) on vacation. I told her it was fake- she was truly surprised. She even thought my husband had bought me a fake until quickly let her know I had left my real stuff at home. One other woman complimented me on it, but I just said thank you rather then tell her it was fake. The set served its purpose and I will continue to wear it when I travel. It is very relaxing not having to worry about my jewelry on vacation. It was also very comfortable to wear. I would recommend this set to family and friends. I LOVE THIS RING! It reminds me of my daughter's real one.....only not thousands of dollars! Looks so classy and sparkles and I like the way the diamond circle overlaps the second band. I've gotten many compliments at church, out shopping and from my friends. I tried several others but didn't like any of them for different reasons. I knew this was the one the minute I put it on! True to size.........I wear a 5 and it's perfect and the diamond size is not over powering or fake looking. So i had to return it. I don't think CZ will work in my world. no one could believe this looks real! YUCK! This is the 3rd and last ring I'm buying and sending back to overstock! So cheap and fake and right off I see a missing stone! There's a huge gap not shown in the pic that screams fake and cannot be hidden. It looked and sounded like a toy ring and I'm not sure how it's getting good reviews it doesn't pass as real to anyone I asked? Not happy with it at all but overstock was great about refunding the whole amount and did so pretty quickly after I sent it back. I love this ring!! it's beautiful, it fits just right and it does not look fake at all!!! I just got my ring in the mail yesterday. I am very pleased with how it looks. I read all of the reviews before I bought it and everyone was right, it looks a little antique. Its light in weight and very shiny. The detail on it is very pretty. I plan on buying another one because I want the wedding bans to be on each side of the "engagement ring" so it sits even. Plus I think it will make it look even nicer. "Is this a 2 piece set or are they made together?" Thank you for your interest in the Tressa Sterling Silver Round Cut CZ Bridal Ring Set. It is a set.